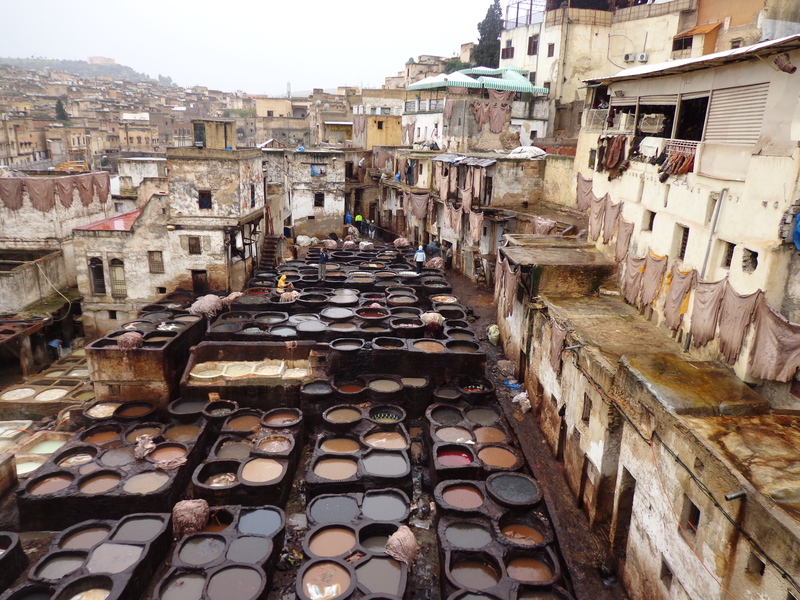 We had minibuses to take us into the town of Fez where we took an organised tour of the souks. We were told that the old town had over four thousand narrow alleyways and it would be easy to get lost but we felt it was just a way for them to get us to visit certain shops. It was raining heavily when we all set off following our leader and clutching our umbrellas. The narrow alleys were thronged with shoppers, sightseers, vendors and delivery people running up and down the steep cobbled paths with heavily laden carts or leading donkeys stacked high with produce. Underfoot became a torrent of filthy water as we hurried up and down steps, carefully negotiating uneven paths. You hardly dared look up for fear of getting your foot caught in an unprotected drain, half hidden by muddy water. I was so glad we had decided to wear our waterproof walking boots which kept our feet dry and out of the filth. We visited a tannery and were given a sprig of mint to help combat the smell. We also visited a carpet cooperative where they gave us all mint tea whilst they showed us their wares. The carpets were beautiful but very expensive (£2,000). None of our group bought anything. We also visited a pottery and a leather goods shop, again, none of our thrifty campers was tempted.